Homeowners who have a generator on their property have likely purchased the equipment in order to stay prepared. Staying prepared for power outages can be incredibly important, particularly when it comes to preserving the comfort and safety of your family. Generators come in a variety of different sizes and styles, and they can range in terms of power output. With that being said, all generators can suffer from similar problems when they are not properly taken care of. In order to maximize the lifespan of your generator, you are going to need to follow a small collection of simple tips. Let’s go ahead and outline those tips below! Your generator is a machine. Like any other machine, your generator needs to be properly taken care of in order to stay in proper working condition. Think of your generator like your car. Without proper maintenance, even when not in use, you can run the risk of watching your generator completely fall apart. The last thing that you want to deal with is a broken generator, right when you need it most! Fortunately, taking care of a generator can be easy so long as you follow this collection of simple tips and tricks. 1) Keep Oil & Filters On Hand – In order for your generator to stay operating efficiently, you are going to have to stock replacement parts on hand. For a new generator, you’ll need to change the oil on the machine after about 25 hours of use. After that 25 hour mark, if you don’t change your oil then you are likely going to be doing damage to the machine. After your first oil change, you’ll want to be dumping and refilling your oil every 50 hours. 2) Purchase A Warranty – Obviously, having a warranty won’t make your generator physically last longer. However, having a solid warranty will help you to always have a backup option in case your generator fails. If you purchased a generator, it was because you wanted to be prepared for emergencies. Warranties are a great way to stay prepared in case of an emergency with your generator. 3) Purchase An Enclosure – If your generator is located outside where it will be beholden to weather, you need to protect the machine. Consider purchasing a cover or an enclosure in order to protect your generator from rain and snow. Water damage is definitely something that you do not want to deal with when you own a generator. After all, water and electricity simply do not mix. If you are feeling exceptionally handy, consider building a sort of dog house or mini-garage for your generator. 4) Chill Before Re-fills – If you have been running your generator and need to refill the gas tank, take a moment to think. Don’t start pouring gasoline into a red-hot generator! If you were to spill the gasoline onto the red-hot generator, you could end up dealing with a whole new kind of problem. When refilling your generator’s fuel tank, always let the machine cool down first. You don’t want to create a new problem that could cause harm to you and the people around you. Consider letting your generator chill for at least 15 minutes before adding more fuel to the machine. 5) Power Up Your Generator Every Quarter – Remember when we compared your generator to a car? Like a car, you wouldn’t want to leave your generator completely stagnant for months or years at a time. Manufacturers typically suggest that you fire up your generator at least once every three months in order to give the battery and starter some work to do. By powering up the generator every quarter, you can keep the machine operating correctly. Additionally, you’ll be able to diagnose potential issues before they arise. 6) Keep Fuel Tank Filled – Unless you want to go shopping at the Honda Generator Place, you might want to make sure that your fuel tank is always filled up. When it comes to common generator problems, no issue is more common than damage due to an empty fuel tank. If your generator runs out of gas, you need to turn the machine off right away. When your generator is in operation with an empty gas tank, you are actively damaging the machine. If you mess up and accidentally keep your generator running while out of fuel, you are likely going to need to make a run to the nearest repair shop. 7) Lock Down Your Generator – Finally, you really need to consider tying your generator to the ground. While your generator might be heavy enough to dissuade some people from stealing it, it won’t be heavy enough to keep committed criminals from doing the job. Additionally, by securing your generator to the ground with the proper grounding rod, you’ll also be able to prevent dangerous shocks from manifesting and harming people. When you have your generator installed, make sure that you ask for the machine to be tied down and grounded with the proper materials. 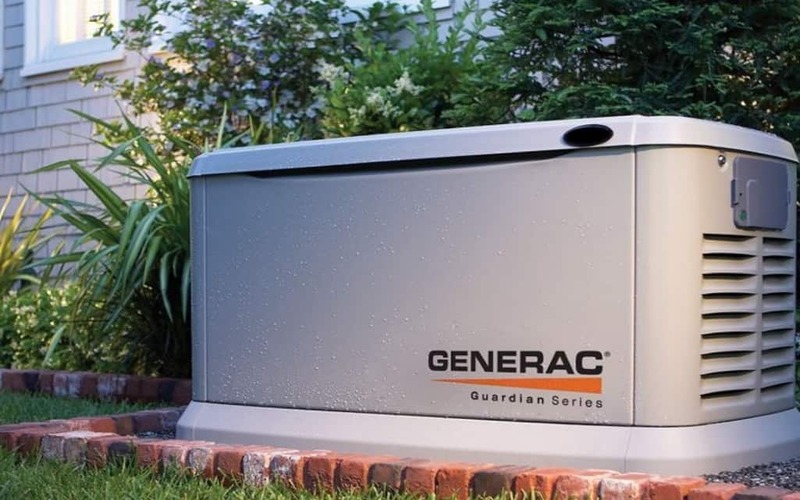 If nothing else, securing the generator will allow you to have safety and peace of mind. Purchasing a generator is a great first step toward making sure that your home is prepared for emergencies. However, you simply cannot purchase a generator without making plans to properly take care of it. Use the maintenance tips that we listed above in order to keep your generator operating at peak performance!